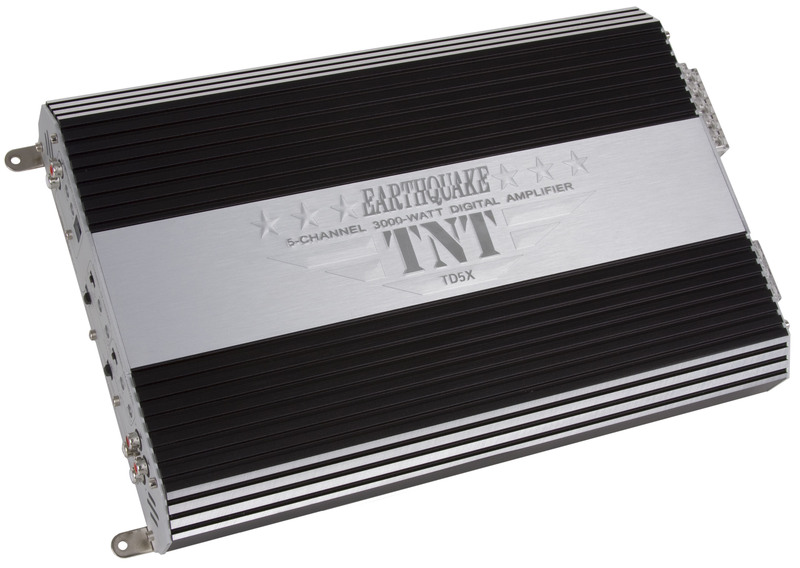 TD5X - Earthquake Sound Corp.
For the past year and half Earthquake engineers have been working on providing consumers with the best 5 channel amplifier; finally, the TD5X was conceived. TD5X’s 3000 watts of max power is more than anyone will ever need in such an install. TD5X has 4 channels for your front and rear sound quality imaging and with over 100 WRMS per channel, it is more than enough for any coaxial, 6x9 or components speakers. On top of that, channel 5, the subwoofer channel, outputs over 400 WRMS thus driving your subs to deliver the best bass you can dream of. When designing the TD5X, Earthquake took into consideration that many cars nowadays have limited space. Therefore, the TD5X has a low profile heatsink that allows the user to install it in a small area. TD5X is of course designed with green technology in order to deliver high power on all 5 channels with minimum power consumption and less strain on the car’s electrical system. To make TD5X easy to install or to upgrade your system with, Earthquake Sound added an auto sensing option which means that you no longer need to fish for and run a remote turn on wire from the head unit to the amplifier. Simply plug in the RCAs and the TD5x will automatically come on when it senses music; TD5X will then shut itself down when there is no music for 20 minutes. There are too many options to list here so please contact your local dealer to learn more about TD5X or simply visit our website here.